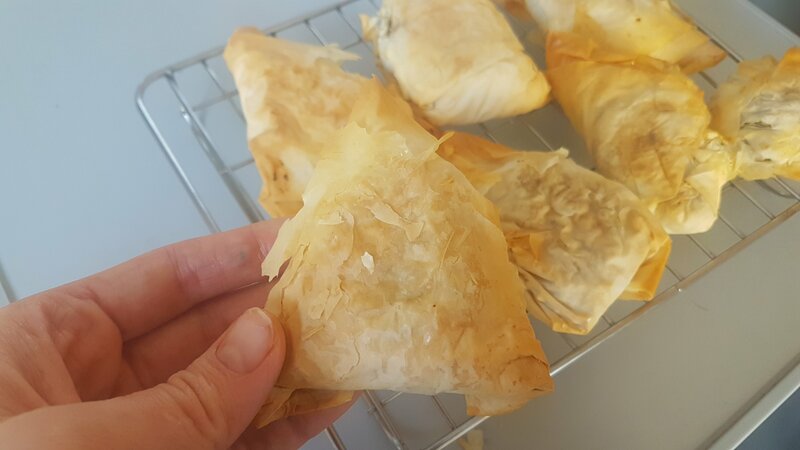 So Vegetable Samosas may not be the first thing you think of when your planning to bake with your kids but I promise they will love making these tasty little parcels. I’ve been battling the flu this week and have avoided the kitchen a bit but parenting an 18 month old and a 3 year old whilst house-bound leaves you with limited options for their entertainment. We have more play dough than carpet on the stairs and our kitchen table is now mud-green from the paint fiasco. So it was only a matter of time before we headed back to baking. In all fairness to the girls they have been brilliant whilst I’ve been poorly and have definitely helped pull me out of the pitty-parade by being generally hilarious. My 3 year old is teaching the baby the YMCA currently and that could warm the heart of the coldest Scrooge. 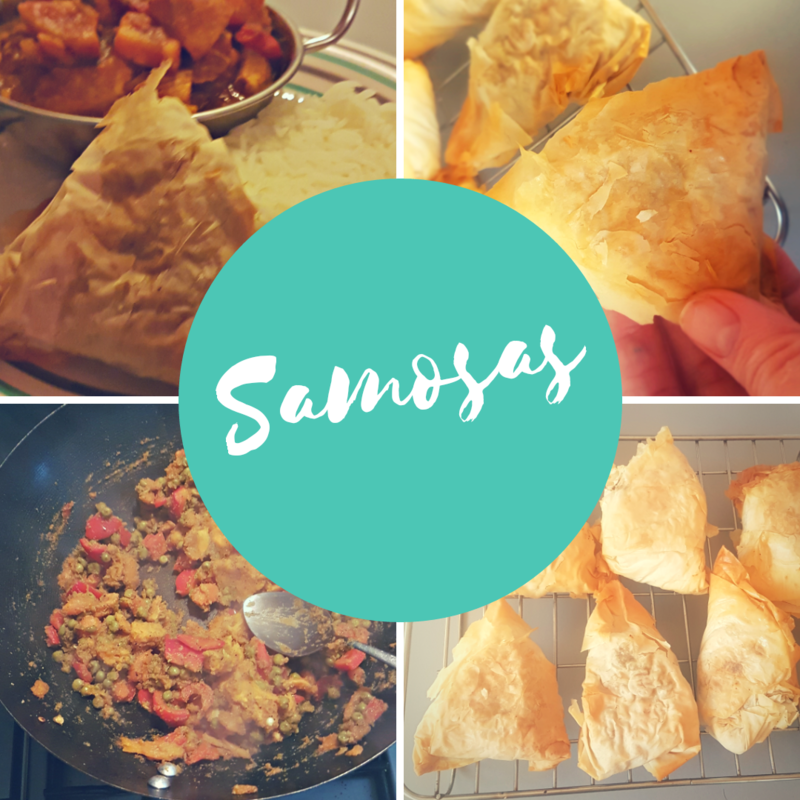 To make these vegetable samosas you will need a baking sheet lined with greaseproof paper. Peel and chop the sweet potato and carrot to 2cm cubes. Boil for about 10 minutes or until tender. Finely chop the red pepper and pop in a frying pan or wok. Add garlic and fry over a medium-high heat for a couple of minutes until starting to soften. Add the Madras powder and cook whilst stirring for 1 minute. Add the peas and the sweet potato-carrot mash and crumble in the stock cube. Lower the heat to medium-low. Continue to cook over a low heat for a few more minutes until all ingredients are well combined. Remove from the heat. 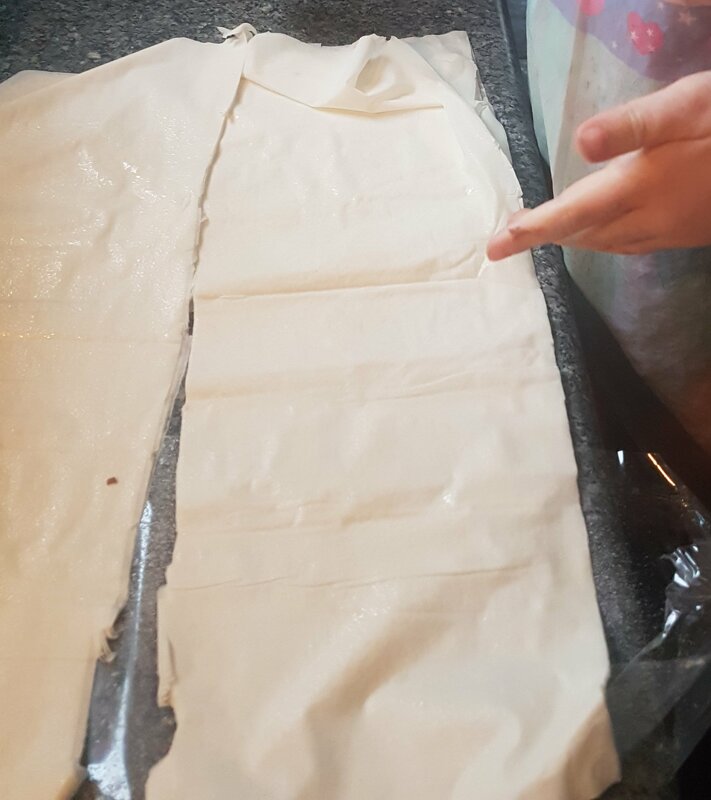 Unroll the filo pastry (try to keep the sheets together) and cut each sheet lengthwise so you have two long rectangles of pastry. 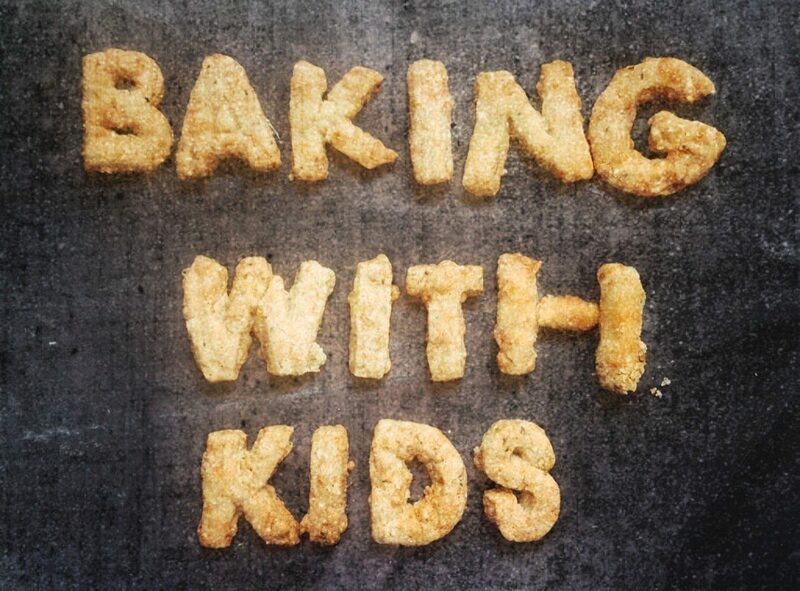 Spray generously with cooking oil (we used frylight). 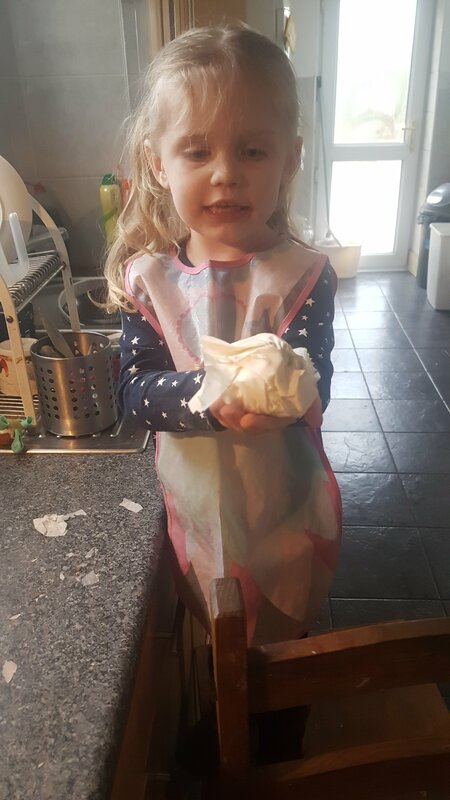 Pop a heaped tablespoon of the Vegetable mixture in the bottom left hand corner (see photos) and gather 2 sheets of pastry underneath. 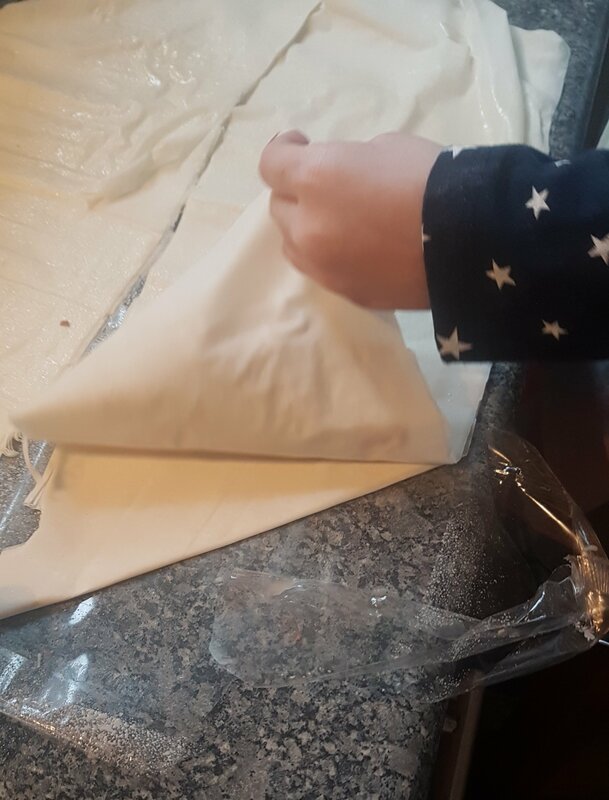 Fold the pastry up towards the right, then down towards the right and continue folding in an up-down way until you reach the end of the pastry. As an adult you may have a nice triangular parcel now. Once lifted off you should have 4 sheets of pastry remaining underneath. Spray the top layer with oil and continue as above. Once all the pastry is used you will hopefully have 6 samosas of varying shapes on your baking tray. Spray well with cooking oil and bake for 25 minutes or until crisp and golden. 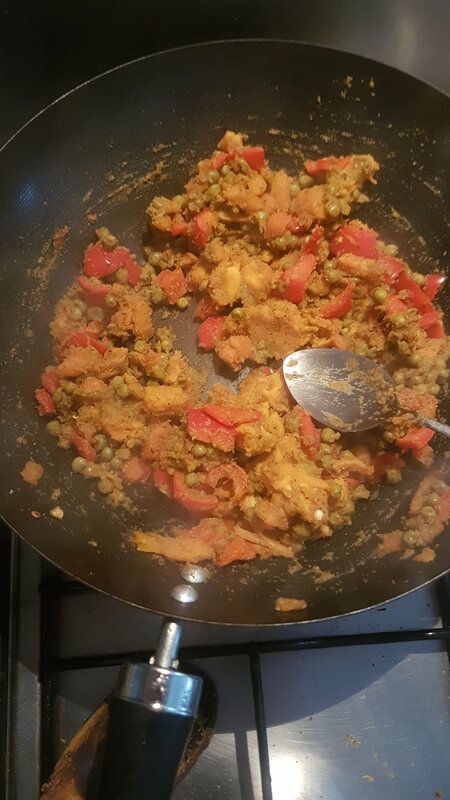 Enjoy with a nice healthy curry and rice. 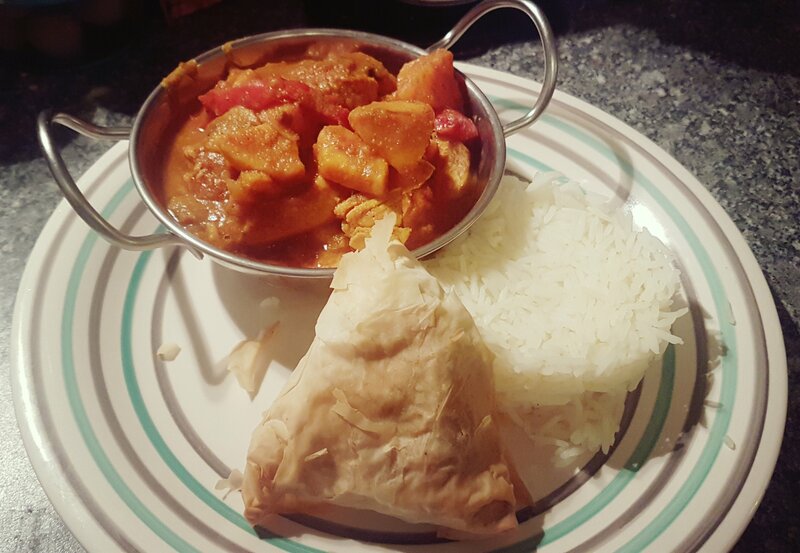 Why not try our Pumpkin Curry recipe for a low fat treat? Forgot to say, hope you feel better soon!